A user with Administrator rights can change company settings, set up legal entities, segmentation and categorisation lists, templates, legal terms, etc. in System settings. To access System settings, click Admin >>> System settings. Edit existing lists or add new entries depending on how you want to manage your company. You can set up one or several generic company email accounts. 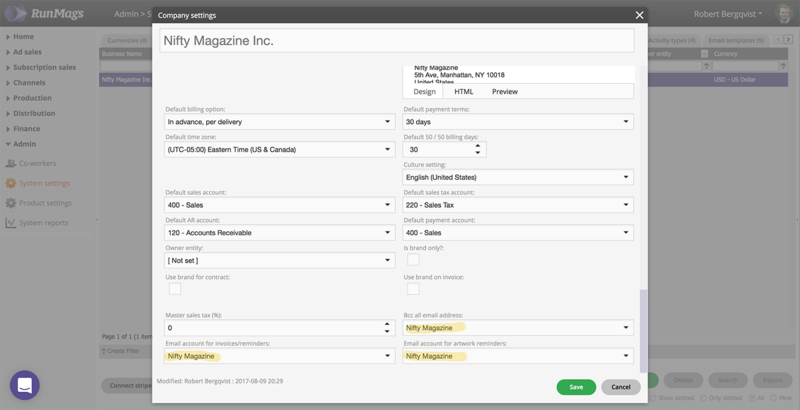 As an example, this can be used to send all your invoices from an address such as billing@niftymag.com or have your artwork reminders go out form reminder@niftymag.com. First, follow these steps to set up your email accounts. Then, as indicated below, select the email accounts you want to use.